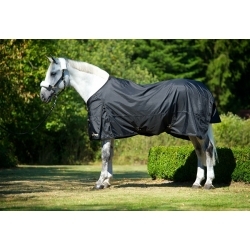 Urban Horse promotes a Back on Track Therapy Waterproof Turnout Horse Rain Rug with Welltex Infrared Technology. Black in Colour. The Back on Track Rain Rug is a unique product that allows your horse to get the Back on Track effect even in bad weather. It features a lining made of polypropylene cross surcingles, gussets and a tail flap. The rug is water resistant and can withstand many weather conditions. This is a very popular rug with top riders and horses! The Welltex - Material means that your Horse or Pony can benefit from the restorative properties of infared heat and a sense of well being. Ceramic powder is melted into the fibres of the fabric. The Welltex - Material TM Reflects body heat in the form of infra red heat, an energy form know to increase well-being.